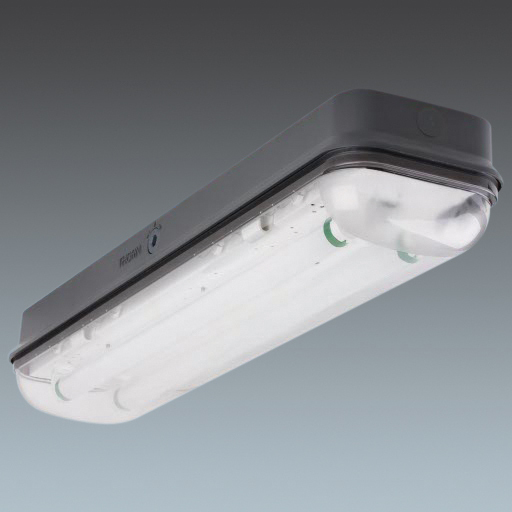 A robust luminaire, suitable to operate in ambient temperatures of 40°. For 2 x 18W T26 lamp(s). Electronic, fixed output control gear with 2 hour, manual test, emergency lighting circuit. Class I electrical, IP66, IK10. Body: die-cast aluminium with less than 1% copper content (LM6 equivalent) finished dark grey powder coat. Diffuser: polycarbonate. Safe-T Locking System (SLS): thermoplastic alloy of polycarbonate and acrylonitrile butadiene styrene (ABS). Gasket: liquid poured. Lamp to be ordered separately.